When you live in the Southern AZ area, you need to think about how your roof will protect your home from local weather conditions. After all, a roof is an important component that helps protect the rest of your home and keep your family safe. In this area, your roof will face intense heat from the sun and heavy winds and rains from monsoon season. Does a metal roof provide protection against these conditions? How Does Metal Roofing Hold Up in Arizona Weather? Because it’s strong and lasting, metal roofing can be a strong choice. This material can often handle tree limbs falling on the roof, which could happen during the heavy winds of a Southern AZ monsoon. 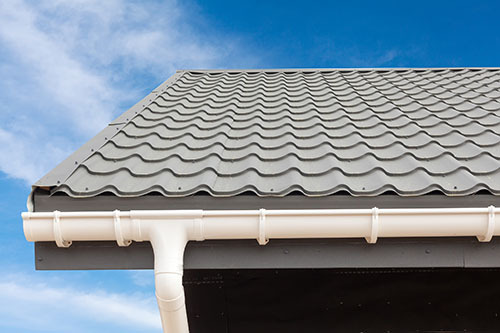 Speaking of those winds, some metal roof varieties are able to handle up to 140 mph winds. Metal roofs tend to stay intact better than asphalt when they face tough weather conditions. Plus, they can be affordable and quick and easy to install. Nonetheless, the price can vary greatly, in part because of different metal options, and costs more than asphalt. Metal might not handle all of the area’s weather conditions well. Since lightning is common in Arizona, especially during monsoons, you need to ensure that the metal roof is grounded to protect your home and family. Another factor is that the rain can make noise on a metal roof. This could be relaxing during a light rain but you might find it overwhelming during the heavy rains of a monsoon. Nonetheless, if this bothers you, you could add additional insulation. Certain steps can help you get the most from a metal roof. Consider the type of metal, which can make a major difference in terms of pros and cons. Some common types include tin, aluminum, zinc, stainless steel, galvanized steel and copper. Aluminum could be a strong choice in the Tucson area because it deflects the sun to help keep your interior cooler in the AZ heat. Nonetheless, a reliable roofing company can help you compare the different materials to find the right fit for the weather and your preferences. Also, you can prevent some of the problems of metal roofing. A proper underlayment can minimize the noise of a metal roof, while proper decking makes it strong to walk across. Further, certain coatings can prevent rusting and keep the home cooler. When you have a metal roof installed or fixed, you need to make sure you have qualified and experienced roofers do the job. Otherwise, you can end up with problems such as a reaction from mixing metals that leads to corrosion. At Tony's Roofing in Tucson, we bring more than 10 years of roofing experience to your job. We can help you understand metal roofing and which material could best fit your Southern AZ home. In addition, you can expect us to install or repair it correctly. Learn more about the experiences of our previous customers by reading our reviews, and check our A+ rating with the Better Business Bureau. To get a free quote on your roof, contact us today.